Earlier this month the Fraser Institute issued a report that ranked 719 of Ontario’s high schools according to standardized tests given to grade 9 students. The tests are to determine if students meet the provincial standards in academic math, applied math and literacy. 224 (tied) Stratford Northwestern S.S.
224 (tied) Listowel District S.S.
At St Marys DCVI 128 students took the tests. In the literacy test, which is pass or fail, 82% passed. In the math test students are ranked according to 4 levels. Levels 1 and 2 suggest that the student has not yet met the provincial standard. Level 3 is considered the provincial standard and Level 4 represents achievement well above the expected level. The average level for St Marys’ students was 2.9 for academic math and 2.8 for applied math. The results for St Marys are worse than last year, but the Fraser Institute says the trend over the last 5 years is not statistically significant. Yesterday afternoon, high winds were blamed for the power outage in the west end of St Marys affecting about 1900 people. The winds also caused about 50,000 to lose power in Chatham-Kent, Lambton County, Strathroy in the morning and 6,000 in London in the afternoon. In Stratford the winds brought down the 62-foot cross outside the Parkview United Church. The cross had been erected at the same time as the church had been built in 1961. 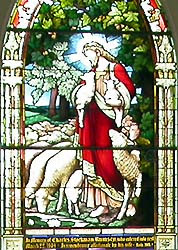 Shown is a stained glass window representing Christ as the Good Shepherd, in the sanctuary of St James Anglican Church. It was was donated in 1905 in memory of C.S. Rumsey, who died the previous year, by his widow. Charles Stockman Rumsey was the manager of the Federal Bank located at Queen and Wellington in the building now occupied by Descardins Credit Union. He and his wife lived above the bank and shortly before his death purchased the first automobile in St Marys, a Cadillac.